Le CRHiDI organisera l'édition 2018 de la conférence du 24 au 26 mai à l'Université Saint-Louis. An omnipresent phenomenon, war was a dominant social fact that impacted every aspect of society in the Middle Ages. Abandoning the so-called histoire-bataille that studied war on its own as an isolated succession of battles, studies have moved towards investigation of the reciprocal relationships between military conflicts and the economic, legal, political, religious, and social spheres in the Middle Ages. After previous meetings held at the University of Leeds in 2016 and the University of Lisbon in 2017, the 2018 edition of the Medieval Culture and War Conference takes place at the Saint-Louis University, Brussels, and focuses on the theme of Power, Authority, and Normativity. Papers will discuss how medieval warfare, through the organisation, the techniques, and the discourses it mobilised, contributed to the shaping of power and power relationships, and how these power relations, in turn, could influence the adoption of certain forms of military organisation and techniques of warfare; how war related to the concept of authority; and how it was regulated by changing sets of rules over the period. 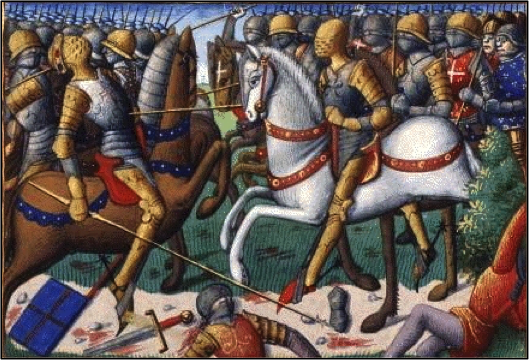 How did power relationships, ideas about authority, and evolving norms have an impact on medieval warfare in theory and in practice? Papers from various theoretical and disciplinary backgrounds (military history, social and political history, legal history, art history, literary studies, gender studies, urban history) will be presented.